Cody Ryan Greaney is a 35-ish year old graduate from Texas State University. In college he was the live personality for a local radio station giving local news and weather reports daily. After graduation, Cody Ryan went to full-filling his passion by hitting the bass fishing circuits and guiding hunts. 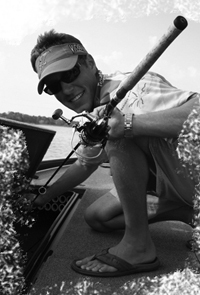 With knowledge in the marketing industry and a passion for the Professional Angling world, Cody Ryan has promoted sponsors through tournaments, outreach programs and events. Cody Ryan currently hosts the #1 Outdoor Radio show in Texas with his father TJ. When he is not on air, Cody Ryan is chasing bass in various tournaments across the lower US or passing on his passions to the next generation. Cody Ryan was one of two organizers of the Dell Children’s Medical Center fishing event, named as the leading event the hospital has put on for the young patients. In conjunction with the multiple youth events he participates, Cody Ryan was awarded the Bass Pro Shops Pass It on Award for 2013. Cody Ryan has been guiding bass fishing trips and hunting trips across the state for more than 15 years. His passion for the outdoors is evident and he is not afraid to thank the Lord each day for allowing him to live the life he leads. Cody is married to the most understanding woman in the wold Nicole. He also welcomed his best catch in 2018, his daughter Saylor.